The Akshaya Patra Foundation received the Asian MAKE (Most Admired Knowledge Enterprise) award from the CII (Confederation of Indian Industry), at the CII National Knowledge Summit 2015 held in Bangalore on 19th and 20th of March. 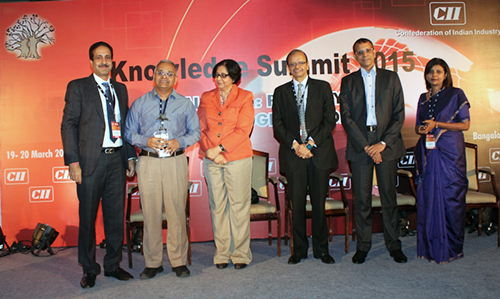 The theme of the summit was establishing the pathways to a 'Digital India'. The Asian MAKE study conducted by Teleos, in association with the KNOW Network was started in 2002. It identifies organisations founded and headquartered in Asia, that create/increase stakeholder value through utilising new or existing knowledge to develop better products, services and solutions. Akshaya Patra was the only organisation from the non-profit industry to win this award. A panel comprised of Asian-based Fortune Global 500 leading knowledge management and intellectuals selected the winners through a three round process. In the first round, the judges on the expert panel nominated enterprises for evaluation. In the second round, each judge selects a maximum of three 'best practice' organisations, and those which have been chosen by a minimum of 5 per cent of the panellists are deemed the Asian MAKE finalists. In the third round the finalists are ranked against the eight knowledge performance criteria that comprise the MAKE framework. Some of these criteria are "creating a knowledge-driven enterprise culture, developing knowledge leaders and workers, innovation (R&D, creativity and new product/solution/service design and delivery), maximizing enterprise intellectual capital and enterprise-wide collaboration and knowledge sharing". There were totally 68 organisations nominated as 2014 Asian Most Admired Knowledge Enterprises, from which 35 were chosen as finalists. There were totally 20 winners of the 2014 Asian MAKE study. Aside from Akshaya Patra, some of the other Indian organisations to win were Hindustan Unilever Limited, Infosys Limited, Tata Consultancy Services and Wipro Limited.